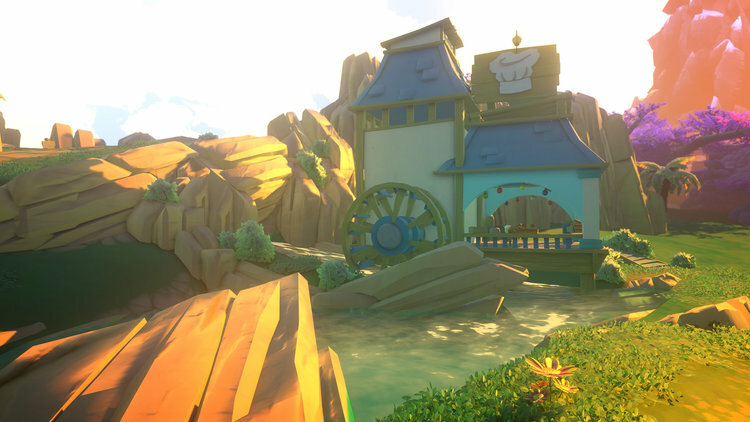 Yonder: The Cloud Catcher Chronicles is a gorgeous open-world fantasy game in which the player can explore a colourful array of environments, discover the source of the mysterious Murk that plagues the island, farm, craft, fish and complete quests. It is available on PC (via Steam), PS4 and Nintendo Switch. 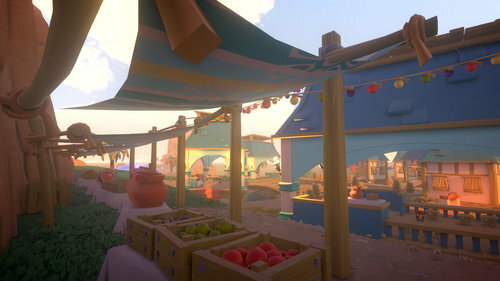 The two adjectives that, to me, define Yonder: the Cloud Catcher Chronicles are “peaceful” and “sweet” – it’s ideal for chilling out at the end of a hard day. It’s suitable for kids, too, but in such a way that adults can have just as much enjoyment. Your character starts out on board a ship heading towards the island nation of Gemea, an ancient culture suffering under a curse in which vast swathes of the island are inaccessible because of a mysterious purple haze called Murk. Your task, with the aid of cute little magical creatures called Sprites, is to discover the source of the Murk and clear it away. To achieve this, you must explore all across the island, finding more Sprites and completing quests, gathering resources, trading with the population of the island, and discovering truths about the past. The main story is fairly straightforward, and doesn’t take particularly long. But there is plenty else to be doing besides: completing quests for the vibrant array of characters inhabiting the world, building farms and caring for the animals, gathering resources and crafting useful items with them, customising your player character to look and dress how you want, discovering unique locations, searching for treasure, and fishing in the various waters of the island. All of this takes place in a beautiful world. The art style is bold and chunky, giving a friendly, non-threatening feel to the world that perfectly suits the tone. Each of the eight environments – from open grasslands and sunny beaches to shady woodland and icy peaks – has a unique, easily recognisable feel to it. The unique fantasy animals have the same feel – they’re cute, cartoonish, and easily recognised from a distance. It’s a charming game, and easy to get caught up in, searching for different animals to bring to your farms, or finding the resources needed to complete quests, or discovering what secrets might be hidden in shrines. The music, too, is charming, with the same sweet feel to it as everything else about this game, and input into the game with thought and care – for example, as musical cues at sunrise and sunset. There are a few little easter eggs to look out for too. Fun little hidden things that demonstrate the creators have a sense of humour, not to mention a sense of mischief. I won’t spoil them, but some require you to be quite thorough in your explorations! Altogether, this makes for a well-rounded game. It is, perhaps, a little short – I have 21 hours playtime according to Steam, and I’ve completed the majority of the content. If you’re a fan of the more relaxed type of game, such as Stardew Valley, then Yonder: The Cloud Catcher Chronicles is a great choice. It’s fun, engaging, relaxing and absolutely beautiful. I rate it 9/10.